Kokichi began his performing career at the age of 5 as a member of the Toronto Suwa Daiko a cultural association located in Toronto. Subsequently, Kokichi was introduced again to Japanese music during high school after the death of his grandfather and introduction to the Buddhist Temple where he was re-united with Taiko in 1996 as a member of the Temple’s local group Isshin Daiko. Through this chance encounter Kokichi would come to be a founding member of Canada's first professional Japanese taiko ensemble, the Nagata Shachu, in a career as a lead musician and performer that lasted for nearly two decades. Featured in concerts and festivals throughout North America he is adept at many styles of taiko drumming as well as playing both the Shinobue (transverse bamboo flute) and the Shakuhachi (vertical bamboo flute). ​Since 2012, Kokichi has furthered his exploration of Japanese music and culture through extensive international travel, meeting and performing with respected musicians and artisans. Recently sought after as an independent artist, he has performed in concert and festivals with an incredible trio of winners of the Okaya World Odaiko Solo competition (upright great drum soloist) Kudaka Tetsuya, Shimamoto Ryo and Yanase Kazushige in 2016 and 2017 in Nagano prefecture, Japan. 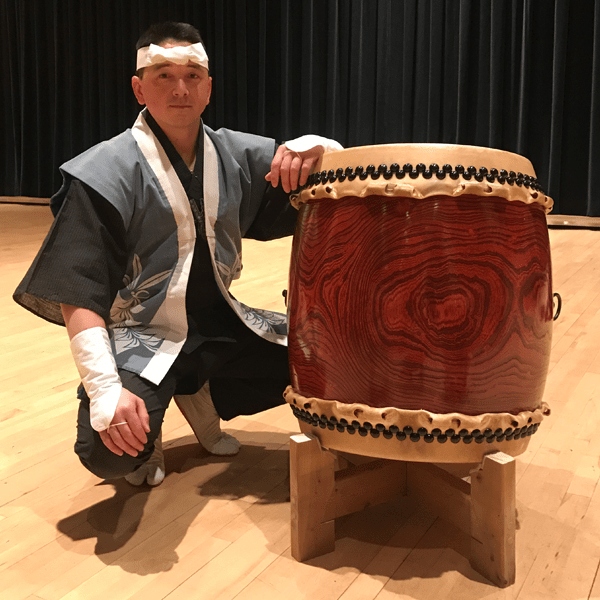 Kokichi has taught classes, coached local teams and lead workshops for youth and adults in Taiko and Shinobue in both Japan and Canada. ​Kokichi's early work in Canada included appearances alongside the renowned dancer/musician Kayo Yasuhara as a guest performer with Komachi in such events as the Otakuthon Anime Festival and the International Percussion Festival in Longueuil (both 2014). Kokichi also teamed up with Ottawa's popular Shamisen virtuosa Ryoko Itabashi in collaborations at the Ottawa Tea Festival and in a feature performance 'Journey through Japan' for the Embassy of Japan (January 2015). ​Kokichi is currently working as advisor and instructor to the renewed taiko and Japanese music program at the Toronto Japanese Canadian Cultural Centre. In addition to teaching workshops and private lessons, Kokichi is actively composing new pieces, pursuing collaborative projects and is available as an artistic consultant for events and groups.